Active Home Care offers a suite of elderly care services for residents of Bal Harbour and the surrounding areas. Our service is compassionate, thorough, professional and personalized to meet your unique needs. Our focus is to give you peace of mind. Select the services you want and we’ll develop a plan to meet your needs and schedule. Our caregivers provide live-in services for seniors who need to have a caregiver with them during the day and at night. This meets the needs of seniors whose condition requires a higher level of care and attention while they live at home. 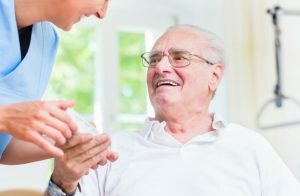 We have caregivers who are trained to provide live-in care for seniors with dementia, Alzheimer’s, Parkinson’s and other debilitating conditions. Your loved one can enjoy the services of a trusted caregiver who will be available every night and help them with medication and mobility. Our live-in care service gives you the ultimate in peace of mind because there’s someone to attend to your loved one around the clock. What Are the Benefits of Our Senior Care in Bal Harbour? Seniors who enjoy living independently in their homes receive assistance with routine tasks and enjoy the service of our caregivers throughout the day. Our management team carefully selects caregivers who match the needs and traits of your loved one. Choose the time of the day that you want our caregivers to come and assist, and they’ll be there to provide the service you need. We don’t require a minimum number of hours, so you’re free to choose a service plan that fits your budget. To help the elderly overcome the effects of isolation and other emotional challenges caused by loneliness, we offer companion care services. Companionship is combined with assistance with daily activities. Caregivers are available to keep your loved one company during the day as well as run errands, go shopping and assist with physical exercise. Companionship helps keep seniors happy while relieving them of emotional trauma. Enjoy our excellent elderly care services in Bal Harbour. Learn more by contacting Active Home Care today to discuss your needs. We’re ready to provide you with instant help and support.